GenoPro created a series of videos to help you using GenoPro. This video shows you how to insert a divorce and a second spouse on your genogram, as divorce and re-marriage are a common family situation. It also shows you how to enter display information over the union line to indicate the time frame of the union (date of marriage and date of divorce). This video teaches you all about table layouts. Table layouts diplay the entire content of your family tree in a grid format and can be useful for sorting data, finding information, compiling statistics, navigating in your family tree, and finding errors and replacing them. The various features of the table layout can help you save time and energy, as all the information is located in one place and any column of the table can be sorted for easy navigating. 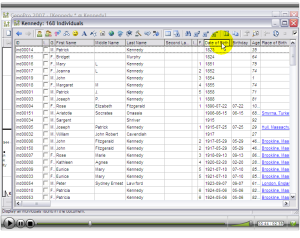 You can also copy the information of the table layouts into spreadsheets for sharing with others. Create a simple family with two children using the family wizard . Add a household to indicate which family members live together. Add a cut-off relationship between the parents, and a distant relationship between the father and his children. Set the parent union as divorced. Hide and display all emotional relationships. 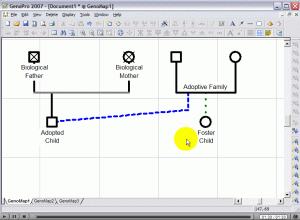 Create a biological family using the family wizard . 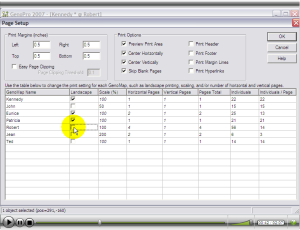 How to use the sorting of the Table Layout to group objects together. The first demonstration is to color in black all the deceased individuals. How to use the Undo. How to use the Table Layout again to sort by gender, thus grouping all males, females and pets. Using the multi-select (by holding down the Shift key), the user can select multiple individuals and color them at once. How to hide some rows from the Table Layout to further refine the display or perform more complex searches. How to color the rest of the tree, such as the males in blue and pets in yellow. This short video teaches the user how to change the order of the mates in a multiple marriages/unions scenario. The user will also learn to change the mate order under the properties screen in the event that the union dates are not known. 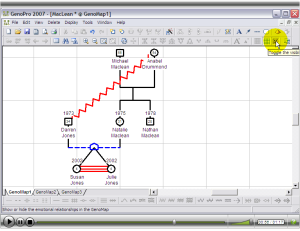 This video teaches you different ways to insert emotional relationships into your genogram to define and explain how individuals relate to one another. It also shows you how to temporarily hide the relationships without deleting them. This video helps you to understand the various print settings in GenoPro. 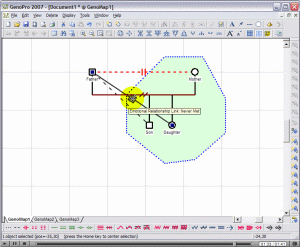 It will show you how to modify the zoom in order to fit your genogram on a required number of pages, and how to print from a plotter. Most of all, you will learn how to print a specific section of your tree by copying and pasting the individuals into a new GenoMap. This video shows you how to add custom tags in GenoPro to include information that you find relevant, but for which there is no specific box. 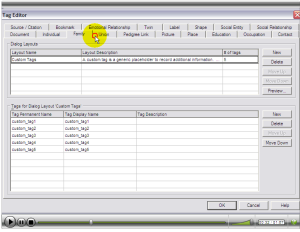 This easy process will allow you to include tags that apply to individuals, families or any other object type. With custom tags, all information will be sorted in the right place and will be just as easy to find as the original tabs provided in GenoPro. This video teaches you how to generate a report with two easy clicks, and then shows you the various features of an HTML-generated report, including interactive SVG (Scalable Vector Graphics). 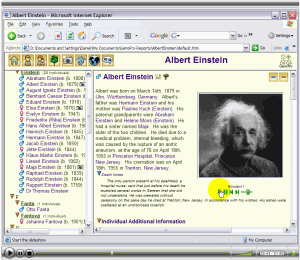 The HTML report is useful to produce an overview of your family tree and to revise its accuracy. You can also share your genealogy by publishing the report online at: http://familytrees.genopro.com. This video teaches you how to customize an HTML report by editing the report skin. In this example, you will learn how to add a report title, a report description, and a picture on your home page. This video is a bit more advanced as it shows you how to modify code to make HTML markers live in the report. This allows you to insert media files without having the codes appear as text. 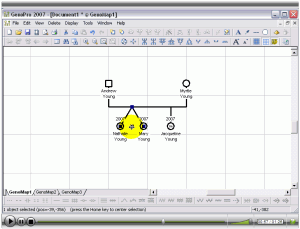 This video shows you how to split a large family tree to free up some space on your pedigree layout without losing the parent-child hierarchy. With only two mouse clicks, you can move an entire branch to another tree (GenoMap). GenoPro takes care of the rest, by creating the necessary hyperlinks to connect the trees. The benefits of supporting multiple sub trees cannot be understated, as it is the cornerstone of scaling large family trees containing tens of thousands of individuals. 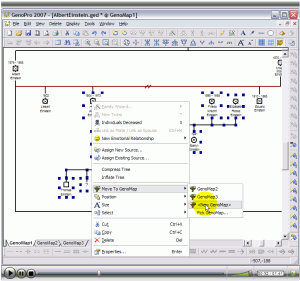 Without the ability to split a large tree into smaller sub-trees, it becomes very difficult to organize information or to create layouts suitable for printing. 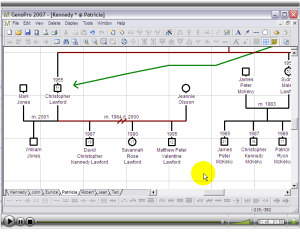 This video teaches you how to open a Gedcom file from another genealogy system in GenoPro, and also how to manually arrange the pedigree layout in case of overlapping. 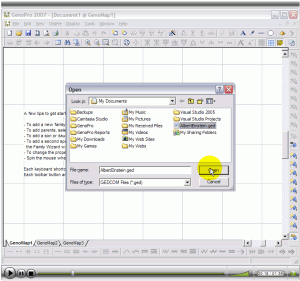 If you have genealogy data from another software, or purchased CDs containing genealogy data, then you can import them in GenoPro. This video teaches you how to create twins or triplets. Although twins are rare cases in family trees, the video shows the basics of how to create special links between individuals born on the same day. Change the display language of the GenoPro's interface. View the completion status of each language pack. Enable collaboration to submit your work to the GenoPro server. Open the properties of the document. Display the list of font available with their respective language support. Select a new font for GenoPro.